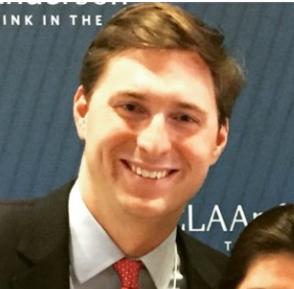 A graduate of the University of North Carolina, Bo Stump joined a boutique M&A advisory after earning his bachelor’s degree. He returned to Chapel Hill to pursue his MBA at the Kenan-Flagler Business School, where he received a scholarship for entrepreneurial spirit. He recently completed his MBA and joined Sageworks Inc. as a member of the bank consulting team. .
A daily medium I’ve really come to enjoy is podcasts. I most enjoy Chuck Todd’s “1947”; “Bloomberg Surveillance” with Tom Keene & David Gura; and Russ Roberts’ “Econ Talk”. It seems like Russ has hosted every speaker I’ve ever heard at an Adam Smith Society event! I’d say the biggest differentiator for the Adam Smith Society would have to be access to the people (members & speakers) and the trips – both the National Meeting in New York as well as the Smith Soc Treks. The speakers at the National Meeting always dwarfed anything we would have on campus, at least all on the same day – this year having Paul Singer and Ken Griffin both speak, as well as one of the brightest up and coming young authors in J.D. Vance, was really special. With regards to the Treks, they’re a triple whammy: fascinating speakers/discussions, exciting destinations, and stellar accommodations. This past year I was able to attend the trek to Boca Raton, where we discussed Capitalism vs. Socialism. It was one of the few times I was able to go into such conversational depth with other MBA students, as well as academics and professionals. The Boca trip was a real treat, and definitely something I would not have gotten elsewhere in my MBA program.